After the first issue’s compellingly sinister scene-setting, the second issue of Francesco Francavilla’s pulp noir take on Will Eisner’s most famous creation features some vigilante action, a deepening mystery and the introduction of a couple of new characters. Will it all be enough to maintain the momentum established by last month’s issue? 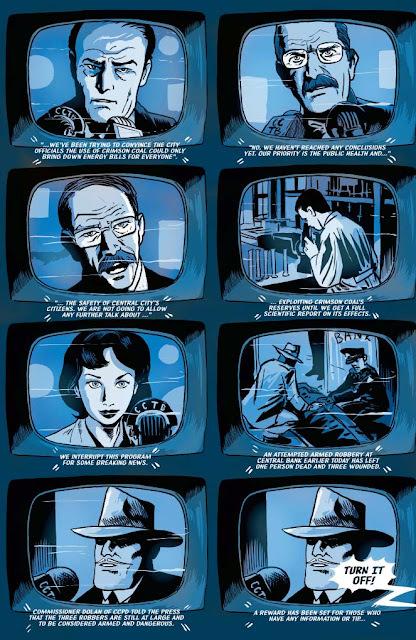 Once we take in the gloriously moody first page with its ominous Raymond Chandler quote, we’re confronted with a page comprising eight TV screens taking us through Central City’s top news stories. Last issue’s dead homeless man hasn’t managed to make it onto the news agenda; the bank robbery that ended last issue has, but even that takes second slot to the ongoing controversy over the ominously-named ‘crimson coal’, a potential source of energy that has yet to be properly tested by the city’s regulatory authorities. This is the second time the ‘crimson coal’ has been mentioned, although how it might tie in to the rest of the story’s events remains, as yet, unclear. 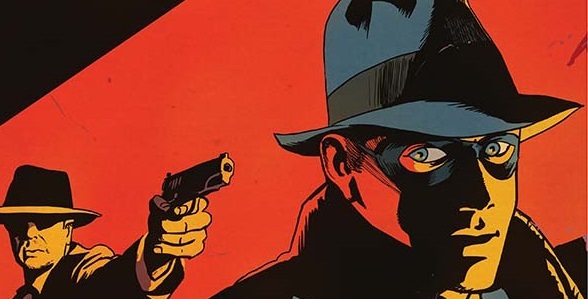 There’s not much time to ponder this, though, because the story quickly shifts into action mode and, once again, I find myself somewhat awed by just how dynamic Francesco Francavilla’s artwork can be. 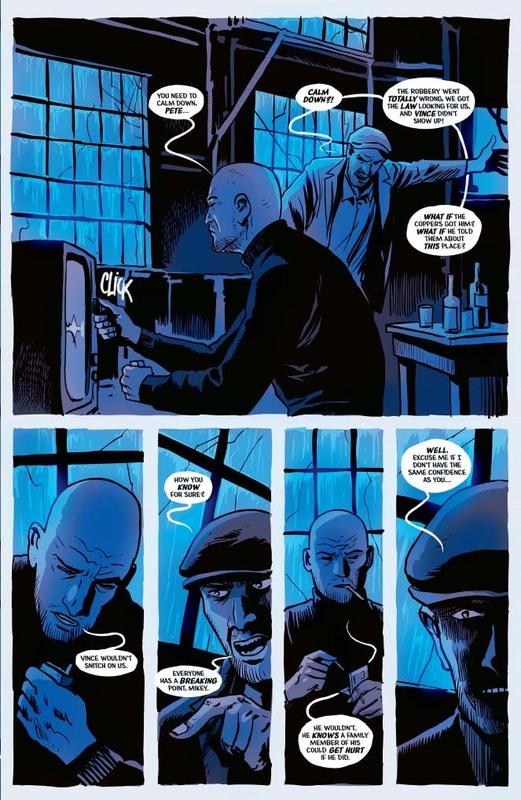 The double page of the Spirit bursting through the window of the bank robbers’ deserted factory hideout is spectacular enough, but the fight that follows it possesses a wonderful fluidity, at least partly because of Francavilla’s decision to dispense with traditional panel borders. It’s also worth noting that the action is made more dramatic by Francavilla’s use of colour, the Spirit’s red tie dramatically punctuating a fight that is otherwise rendered in blues and blacks. While the Spirit deals with the implications that Eb recognises one of the captured robbers, the narrative shifts to introduce Lisa Marlowe (a nod to Chandler that’s just a little too on the nose for this reviewer), a down-on-her-luck PI who’s watching John Bartlett, a “famous entrepreneur” whose wife suspects him of cheating on her. This being a comic book, the subject of her surveillance turns out to be up to something considerably more nefarious than enjoying the charms of another woman. Arguably, this plot strand is the most interesting part of the story as we realise that Bartlett is the man behind the ‘crimson coal’ venture and something extremely fishy is going on involving the city crematorium and a mysterious, hooded man we last saw injecting Eb’s uncle with some unsavoury looking yellow fluid. The issue ends with yet another homeless man being injected, his scream echoing in the night as a train rattles along the railway tracks overhead. As the second part of a five-issue series, this does a good job of moving the plot along while raising more questions about just exactly what’s going on in Central City. 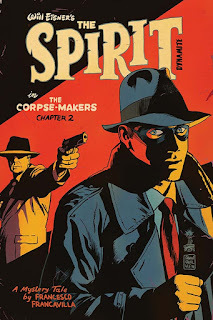 Francavilla’s keeping the Spirit and the main plot apart at the moment, which is, apart from the occasional bit of flat dialogue, the only thing that niggles me about the issue. We do get to see the Spirit in action – and very spectacular that is, too – but it’s Lisa who’s the vehicle for the plot at the moment and that makes the Spirit feel a bit removed from the main action, which seems a bit odd in a comic that bears his name. That said, Francavilla is a phenomenal storyteller and the comic remains a seductive blend of stylish action and atmospheric scene-setting. There’s a delicious feeling of dread in the latter half of the issue when Bartlett and his fellow conspirators meet; their conversation is rich with euphemisms like “factory” and “merchandise” that hint at a horrible ‘processing’ of human life. And that final page is wonderfully chilling. In many respects, this is a typical second issue. Threads are unravelling, but have yet to start tying together in any meaningful way. The sense of mystery is palpable, and the Spirit is given the chance to shine, not only in the fight with the bank robbers, but also in the interrogation scene that follows. The sense of menace, of something truly terrible happening that has yet to be fully revealed, is what makes this story particularly compelling and I’m looking forward to seeing how things play out in future issues. If you want a beautifully presented slice of pulp noir goodness with gorgeously atmospheric artwork and a really rather creepy plot, this is most definitely the book for you.